Nationals' Captain Signs Contract for Next Season. Fan Suggests Trade of Bunch of Locals for Chase and Elberfeld, Which Is Out of the Question�McBride Contested With Stars for Fielding Honors at Shortfield�Baseball Gossip. Bob Ganley is one of the several players who are pleased with the contract sent him by the local club as is evidenced by the fact that he has signed it and returned the document to Manager Cantillon. Sporting Editor Post: Contract pleased me very much. Have signed and sent it to Cantillon. Hope we have a winner. 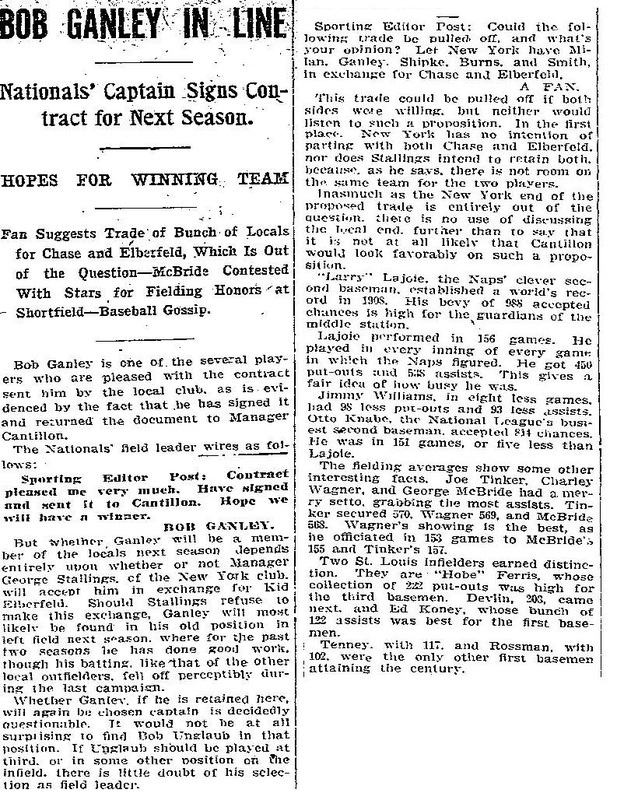 But whether, Ganley will be a member of the locals next season depends entirely upon whether or not Manager George Stallings of the New York club will accept him in exchange for Kid Elberfeld. Should Stallings refuse to make this exchange, Ganley will most likely be found in his old position in left field next season. where for the past two seasons be has done good work, though his batting, like that of the other local outfielders, fell off perceptibly during the last campaign. Whether Ganley, if he is retained here, will again be chosen captain is decidedly Questionable. It would not he at all surprising to find Bob Unglaub in that position. If Unglaub should be played at third, or in some other position on the infield. there is little doubt of his selection as field leader. Sporting Editor Post: Could the following trade be pulled off. and what's your opinion? Let New York have Milan, Ganley, Shipke, Burns, and Smith, in exchange for Chase and Elberfeld. This trade could be pulled off if both sides were willing, but neither would listen to such a proposition. In the first place. New York has no intention of parting with both Chase and Elberfeld. nor does Stallings intend to retain both. because. as he says, there is not room on the same team for the two players. Inasmuch as the New York end of the proposed trade is entirely out of the Question. there is no use of discussing the local end. further than to say that it is not at all likely that Cantillon would look favorably on such a proposition.